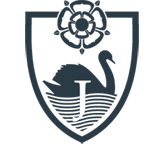 ‌In his first Annual Report, Lord James wrote "A University consists not primarily of buildings, but of men and women, both staff and students" and the collegiate character of York continues to ensure that the University makes outstanding intellectual, sporting and cultural contributions, both on the campus and in the wider community.James College was named after Lord James of Rusholme, the first Vice-Chancellor of University (1963-1972). Lord James had three principles for the development of the fledgling University: that is should be a collegiate University, that it should aim to limit the range of subjects taught, and that much of the teaching should be conducted in tutorial and seminars. One of the more modern Colleges, James College was built in response to the increased student admissions and work began on the first phase, consisting of blocks A, B and C and the lakeside JCR, in November 1989. The College was formally opened by Lady James on 5 October 1992. D, E and F blocks were built in phase 2 of the college and opened in October 1993, and blocks G, H, J, K, L and M extended the college in 2000. In subsequent years there has been further expansion and some upgrading of existing blocks. The College now consists of 13 Blocks and is home to 600 students each year. The College has two of its own Junior Common Rooms, a large dining room containing the college bar and coffee bar. James also houses the students' union and the department of mathematics. Oliver James, son of Lord James, takes an active interest in the College and continues to support its activities. In total the College has over 1500 undergraduate and postgraduate students. Resident and non-resident students play a vital part in the life of the College. In recent years the College has expanded into accommodation and facilities left by Goodricke. This expansion has been marked in 2011/12 by a programme of reefurbishment around the centre of the College. The students' union building has been updated and expanded into the courtyards around Roger Kirk, whilst a new college bar has been created within the Roger Kirk dining rooms. This has left James one of the best provisioned colleges and also one of the largest, occupying the south area of campus between Wentworth, Vanbrugh and the Sports Centre.